Directions: This tour stop [ Waypoint = N37 35.329 W90 37.016 ] is located at the intersection of Russellville Road and Highway 72. 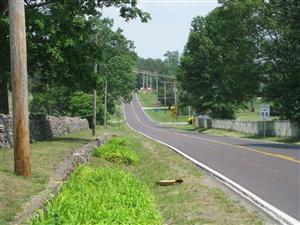 Russellville Road is just across the highway from Thompson Road. Return to your car and find a place to turn around so you can return to Highway 72. At Highway 72, cross over the highway into the street opposite Thompson Road. 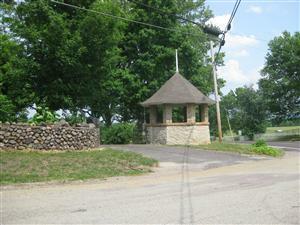 There is a stone gazebo on the opposite corner. Description: You are standing near where Major Wilson had stationed a seven-man picket post in order to provide advanced warning should any enemy approached on the road from Fredericktown. It was early afternoon on September 26th when Confederate forces under the command of Colonel William F. Slemons approached this point from the east. "This picket post was at the junction of three roads; one to Arcadia, one to Ironton and Pilot Knob, and one to Fredericktown, to the east, whence we were then hourly expecting General Price to attack Pilot Knob. This was the most advanced picket post on the Fredericktown road that I then knew of, and was in a locality called Russellville … We were all seated in a circle around the “mess pan” in the shade of a tree, eating rather than watching, when we heard the report of a gun to the east of us. We looked in that direction and saw a close column of cavalry advancing by platoons on the Fredericktown road,—the head of the column then being some fifty or sixty yards down the slope of the next rise and about two hundred and forty yards from us." "My sudden move toward the rear caused the enemy to quicken his gait on the right, next to Stout's Creek, so Sergeant Atchison at once started in with his men too, about one hundred yards behind me." "I hope I may be pardoned for saying so, but I was convinced then and have been ever since that Gourley intended to do as he did: run away and hide, and permit the Confederates to take Ironton completely by surprise. I saw him no more that day and have no doubt he acted the part of a traitor and deserved to be shot. If he should ever read these lines, I hope he may be able to prove that I was mistaken in his case."